Although costumes are right up there on the list of important spooktacular things, it's all about the candy on Halloween. How much did you get? Did you get any full-size candy bars? Which house on the block is giving away candy apples? Who's going to get the most candy by the end of the night? It's all so exciting! 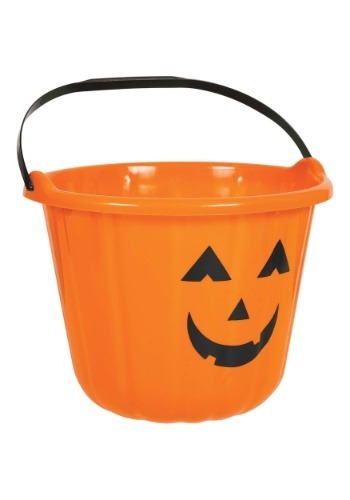 If you want to make your child's Halloween experience even more memorable, then the pumpkin treat bucket is essential. It's a Halloween classic accessory, bright orange and able to hold the yummiest goodies. Oh yeah, it's a whole lot easier than hollowing out a pumpkin, attaching a handle to the top and using it as a trick or treat bag it's also more stylish than using a plastic bag or pillowcase. Use it again, year after year for candy collecting. The molded plastic bucket is approximately 6.5-inches tall so it holds plenty of miniature candies (and full-sized candy bars too.) A gap-toothed, smiling Jack-o-Lantern face is printed on the side and a plastic handle is attached to the top for easy carrying. Of course, you can wear any costume with this treat bucket but pair it with a pumpkin costume for an added dose of orange.